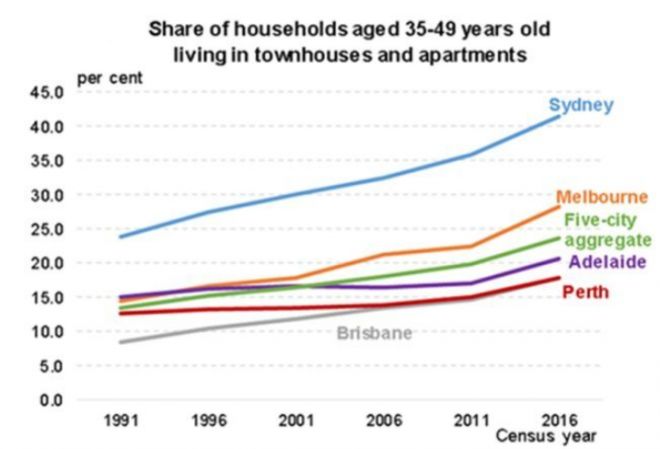 NSW PLANNING LAW CHANGES; Precincts; High-rise, Medium-Density, Greenfield Code, Zoning, Complying Development … | COMMUNITY ACTION ALLIANCE FOR NSW (CAAN): HOUSING INEQUALITY WITH AUSSIES LOCKED OUT! THE Catholic Church is a Developer … make of that what you will! The cost of parking in hospital facilities across Sydney is prohibitive which results in the surrounding neighbourhoods being parked out. These residents have, it would seem, every right to object to the loss of their amenity to benefit yet another developer! Why, apart from cost cutting, does the Catholic Church not build three separate “seniors living” centres in keeping with the character of the neighbourhood in different suburbs to make them more accessible for the families? AND when the lifts are out of action, how do they propose to get people out … that are infirm? But Catholic Healthcare’s proposal for an aged care facility housing 135 units and 144 beds in Lewisham, near the historic Petersham Park, is opposed by some residents. The proposed facility includes the construction of three towers up to 12 storeys high as well as the refurbishment of two other buildings on the site of the former Lewisham Hospital and Convent. The site currently houses the Lewisham Nursing Home, which was featured in last year’s Four Corners investigation into the treatment of the elderly in aged care homes. A Catholic Healthcare spokeswoman said the incident described in the Who Cares? report centered on a complaint from the family of former resident Catherine Logan, who allegedly suffered neglect in the nursing home. A spokeswoman for the NSW Department of Planning and Environment said standards of care in aged care facilities were covered by federal government laws. But Jenny Leong, the Greens member for Newtown, said the planning system should allow for consideration of the quality of care provided by the operators of aged care facilities. “There needs to be adequate checks and balances applied to private operators in aged care and that the government must ensure that the elderly are protected and properly cared for,” she said. Ms Leong also said the height, density and scale of the development did not comply with planning rules. “This is not just a concern for the existing local community, but also for the quality of life and well-being of those who would be expected to live in these substandard conditions,” she said. Large-scale developments that exceed planning rules had a significant detrimental impact on local neighbourhoods, Ms Leong said. Kathleen Reynolds, a spokeswoman for Save Petersham Park, said the 12 storeys were proposed for the crest of a hill and would be visible from the park. *Ms Reynolds also expressed concern about the lack of public services such as hospitals, traffic congestion and parking difficulties that would be exacerbated by the development. *The Catholic Healthcare spokeswoman said the proposed development complied with parking requirements and would not impact on the amount of green space in the area. “Catholic Healthcare is committed to creating much needed additional services in Lewisham and surrounding suburbs for a growing ageing population,” she said. 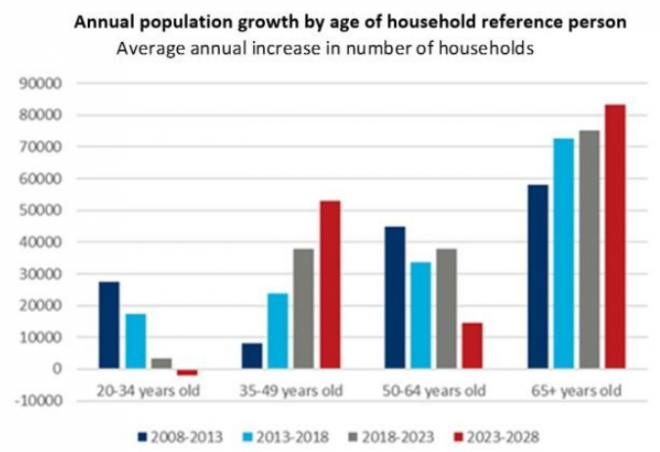 *The number of people aged over 65 is predicted to increase by 62 per cent in the council area by 2036, according to the Department of Planning and Environment. 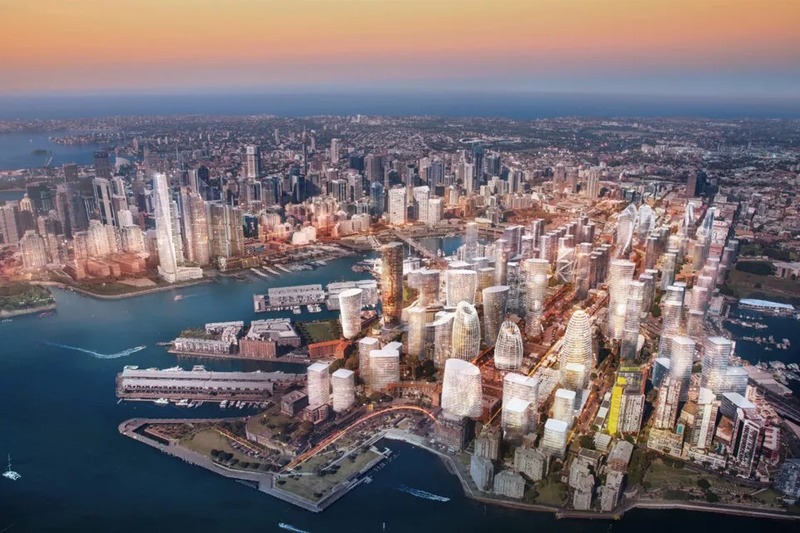 *Planning documents for the $169 million development, lodged with the Inner West Council, have been partially redacted, but reveal the proposal has already been scaled back in size. But the decision to approve the aged care facility will be made by the Sydney Eastern City Planning Panel. Departments are being disbanded. Offices are being closed, merged or rebadged with new names. Power is being concentrated within a clutch of ministers and ministries. And all with little explanation. Gladys Berejiklian has begun what might be her first full term as Premier with a flurry of significant changes to the NSW public service that very few – including senior bureaucrats – saw coming. Yet, she has not offered a significant account of the motivation for the overhaul, other than to assert that it is being done in the public interest. Asked whether the revamp would trigger job losses, she said: ‘‘I don’t anticipate there will be any in regional NSW whatsoever … some people might have different jobs but that is something exciting to look forward to”. Administrative changes released this week reveal the state’s public service has been cocentrated in eight departments – down from 10. But the significance of the changes is even more pronounced. As well as departments, public servants and public responsibilities also reside in agencies and offices that focus expertise within particular areas. Some offices have been abolished, such as the Office of Local Government and the Environment and Heritage, where officials were trying to reassure staff about their job security on Friday. Labor and the Greens are concerned the changes will result in less advice to government. “We’re creating these monoliths that nobody will be able to question,” said David Shoebridge, the Greens’ planning spokesman. The changes are potentially most significant within the planning system. Under NSW planning laws, agencies such as the Office of Environment can make submissions on proposed developments – such as in housing or mining – before they are approved. Sometimes their agreement is mandatory. A spokesman for Ms Berejiklian declined repeated requests to explain how submissions about environmental or heritage concerns would be made without an independent office. Views on the reforms are likely to be mixed. For instance, under an organisation chart distributed within Transport for NSW, Roads and Maritime Services will no longer be a separate division of that department. Public transport advocates have long pushed for the merger of the transport and roads agencies, so all aspects of the transport system can be considered together. 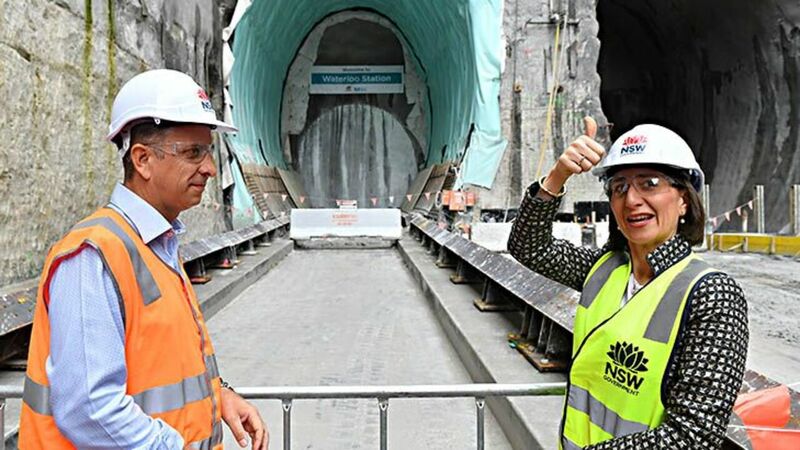 NSW Premier Gladys Berejiklian and NSW Transport minister Andrew Constance at the site of the future Waterloo metro station. The changes also create a super-charged Infrastructure NSW, which was intended to mainly offer independent advice. But the UrbanGrowth Development Corporation – created in 2012 to deliver housing in inner city areas – has been scrapped, with its staff transferred to INSW. The Barangaroo Delivery Authority has been subsumed into the same agency. For now, eight ministers are responsible for the eight new departments. But that is likely to change over the next few weeks, when different aspects of government policy are apportioned over the 24 Cabinet ministers Ms Berejiklian has nominated. The existence of the eight departments, however – one of which is the newly created Department of Customer Service – is not likely to change. Andrew Podger, a former Commonwealth department secretary and public service commissioner, said consolidating within eight departments would be a “pretty radical” change. Mr Podger, also a honorary professor of public policy at the Australian National University, said there were significant advantages in having all departments represented in cabinet, ensuring all perspectives were heard and operations manageable. “But if you’ve got a very large portfolio and you’re briefing your minister, you’ve got to be careful that you’re not just giving your minister only one option,” Mr Podger said. “There may be different views within your large portfolio. Public service consolidated in eight super-departments: Department of Premier and Cabinet (DPC); The Treasury; Department of Customer Service; Department of Planning and Industry; Department of Transport; Ministry of Health; Department of Education; Department of Family and Community Services and Justice. Abolished: Office of Environment and Heritage; Office of Local Government; Barangaroo Delivery Authority; UrbanGrowth NSW Development Corporation. Staff transfers: Heritage to DPC; Arts staff to DPC; Regional NSW staff to Planning and Industry; Transfer of Liquor & Gaming NSW to Department of Customer Service; Aboriginal Affairs staff to DPC. Matt O’Sullivan is the Transport Reporter for The Sydney Morning Herald. Minister for Families, Communities and Disability Services Gareth James Ward and Minister for Finance and Small Business Damien Tudehope. PLANNING IS ‘KING’ AS NSW’s ENVIRONMENT & HERITAGE ARE DITCHED! More of the same! And getting ‘the job done’! There are concerns the environment will suffer while the planning system will be “king” under the NSW premier’s plan to axe the once stand-alone department. *The NSW government body tasked with protecting the state’s environment and heritage has been abolished with the opposition arguing the move will benefit developers. The premier’s department on Monday advised public servants that the Office of Environment and Heritage will cease to be a stand-alone independent body. “To more effectively deliver services and advice to government, both the office of Environment & Heritage and Local Government will cease to be independent entities,” the email, seen by AAP, states. The environment cluster will be absorbed into a new planning and industry department, while heritage will be moved into premier and cabinet. The OEH was responsible for providing scientific evidence and advice on major developments and national park and reserves. It also led conservation efforts across the state. Some public servants are concerned that more projects with potential negative environmental impacts will be approved under the new arrangements. The change has been labelled “terrible” by NSW Labor’s interim leader Penny Sharpe. She argues there will be no independent environmental advice given to government concerning planning decisions. “Under this new system, planning is king,” Ms Sharpe told reporters in Sydney on Tuesday. The Nature Conservation Council says NSW needs a strong advocate within government to stand up to miners and developers. “The decision to downgrade the environment portfolio and subsume it into a super-ministry with industry and development is par for the course from a government that has been at war with nature and environmental protection since it came to power in 2011,” chief executive Kate Smolski said in a statement. Premier Gladys Berejiklian defended the move on Tuesday noting “the Environment Protection Authority is still there”. “When you’ve got a new government it’s the time to make sure you make those changes that provide a better outcome for the people of this great state,” she told reporters in Sydney. 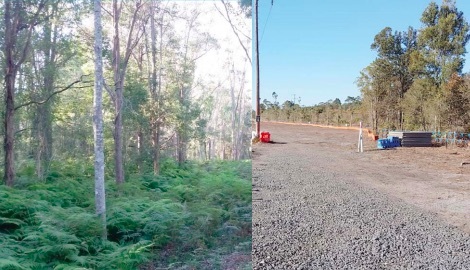 Despite all the contrary evidence NSW Inc forged ahead to destroy the pristine environmental bushland at Ourimbah Road Kangy Angy … it was reduced to desolate wasteland for a train maintenance facility! IS this about developing housing for International Students … full fee paying students? The population growth contrived through immigration has meant Ourimbah residents had to oppose a high-rise mini Chatswood to retain some semblance of the character and heritage values of Ourimbah! – real concerns about the compatibility of new development with Ourimbah’s character and heritage appear warranted! Ourimbah masterplan: artist’s impression of the new Ourimbah. It’s Ourimbah — but not as you know it. Central Coast Council has revealed a complete reimagining of the suburb to include a new town centre involving a realignment of the town main street to extend along Jaques St.
More than 100 new dwellings are expected to be built suburbwide and a move to incorporate low and medium density housing, including shop-top development, will be adopted. The council’s draft Ourimbah Land Use Strategy and Masterplan makes clear a 20-year vision for the suburb as it grows to absorb more of the Central Coast’s expected population growth over the coming decades. Ourimbah’s location beside the M1 motorway and on the train line make it an area with “longer term potential for economic development”, reads the report. It also notes the suburb’s status as a “preferred location” for the federal government’s only high speed rail stop on the Central Coast. An artist’s aerial perspective of Jaques St looking north, as revealed in the council’s 2016 draft. Under the plan, residential growth of small and medium density, such as apartments or villas; would be encouraged in locations with easy access to the town centre and train station. An area along Teralba St and on Baileys Rd would be the first parcels of land to be rezoned over the next 5 years. Teralba St would transition from a rural residential zone to a suburban zone allowing for 60-70 new dwellings, and at Baileys Rd 30-45 dwellings could be built. Other areas, such as the hilltop around Reservoir Rd and at Shirley St, would be considered for residential development over the next decade, and if improvements to Enterprise Drive are realised, the possibility of staff and student housing near the University of Newcastle’s Ourimbah campus would be explored. But it will be a reorientation of the town centre that current residents will feel the benefits. Council has proposed to reorientate the main street away from the Pacific Hwy with the aim of creating a more attractive town centre and an “urban village feel”. The street would have two active frontages, and the council would work to facilitate the development of a small supermarket. The preferred alignment for achieving this, the report read, is for a staged extension of Jaques St. The local road network would be tweaked to ensure residents would not have to join the highway in order to reach the shopping district. This extensive and transformative work would be funded largely by developer contributions. Ourimbah train statin needs better links to the community. Further to this, the council plans to use Dennys Lane to provide direct access to Ourimbah station. The council’s plan notes that this would require the relocation of the telecommunications exchange facility. The report also suggests adaptive reuse of the postmaster’s cottage and the historic post office and the conversion of the Nissen hut into a community centre. To improve the connectivity of the suburb, a new road bridge across the railway would be required, including an alignment at either Burns or Yates road; and an upgrade to the existing rail bridge at Chittaway Rd. A replacement bridge at Shirley St would also be required. Lobbying the state government for an upgrade and improvement to Ourimbah station’s platforms will continue behind the scenes. Central Coast Council first floated the Ourimbah masterplan in 2016. It went on exhibition and community feedback saw the council’s staff make several changes. The current draft reflects a significant scale back of original plans which had set aside land at Walmsley Rd, Railway and Mill St and near the university for more than 500 new residential dwellings. ”It achieves population growth while being more sympathetic to retaining the character and heritage values of Ourimbah. Ms Willard said ORRA had some objections over the proposed town centre. including the Telstra telephone exchange to construct a new main street plus further properties to provide for parking. “Residents’ main concern is that development along Jaques St will be piecemeal, with individual developments being approved. The Tall Timbers Hotel at Ourimbah is a meeting place for locals but fronts onto the Pacific Hwy. “There are also real concerns that there will be no compatibility of new development with Ourimbah’s character and heritage. “ORRA recognises the Masterplan is only a concept but Central Coast Council must develop a strategy to co-ordinate this development,” Ms Willard said. She said the group also had concerns over permissible eight storey development adjacent to the Big Flower site. Among the first set of priorities for the council is to floodproof parts of Ourimbah, and to provide evacuation routes for local residents during a flood event. Council is expected to finalise the plan and implement it at a meeting to be held next month. THE issues raised by both Dr Cooper and Ms Corrigan are currently borne out let alone with another 11,000 additional residents in the St Leonards/Crows Nest area! Royal North Shore Hospital could be forced to turn patients away if state government plans for a population surge in Crows Nest and St Leonards go ahead, a senior medical specialist has warned. Chair of the hospital’s Medical Staff Council, Dr Bruce Cooper, said the number of cases facing the hospital’s emergency department was already growing at six per cent a year, and was outstripping the current growth in population. “We just can’t absorb a further significant population increase,” he said. “If we have to turn people away, we won’t have anywhere to send them. Dr Bruce Cooper: “We just can’t absorb a further significant population increase.” Picture: AAP IMAGE / Troy Snook. Dr Cooper is also concerned about traffic congestion the increased density will bring. “This raises serious questions about how emergency vehicles will access the hospital if the traffic is gridlocked, let alone how staff, patients and visitors will access the hospital,” he said. Registered nurse Carolyn Corrigan, who ran unsuccessfully as an independent in the seat of North Sydney at last Saturday’s state election, described Royal North Shore as “at over capacity”. RNSH emergency department, where demands are already increasing at six per cent a year. She told a public rally last month in Crows Nest, organised by the resident group OVERdevelopment – we’re OVER it!, the NSW government’s plan for the precinct included 7,500 new dwellings, in addition to the 2,000 already under construction, and minimal green space or supporting infrastructure. St Leonards and Crows Nest were declared a priority precinct by the Greater Sydney Commission in 2016. She said the NSW government‘s St Leonards and Crows Nest draft plan proposed to add almost 11,000 more people to the area by 2036. IF ELECTED THE ALP WOULD HAVE SCRAPPED THE MEDIUM-DENSITY HOUSING CODE! It is often derided as the worst planning system in the country, but a few “quick fixes” could help the NSW planning system resolve some systemic issues, new research suggests. The research, commissioned by the Property Council of Australia, argues that a few immediate changes — finalising state strategic plans, revisiting rezoning processes, more diverse housing and calculating development contributions — could deliver economic growth, jobs and housing affordability. The lead up to last weekend’s election was fraught with “toxic debate” about Sydney’s growth and development, Property Council NSW director Jane Fitzgerald said. “We must [f]ocus on creating a planning system that encourages and supports good growth, bolsters transparency and delivers consistent and predictable decisions,” Fitzgerald said. The reliability and transparency of the NSW planning system should be among the “highest priorities” for the recently re-elected government, the report says. Improving the process for rezoning, for example, could deliver a $2.37 billion uplift in gross state product and generate 16,000 new jobs. Finalising state plans and policies that ensure appropriate local zoning, deliver infrastructure and ensure a diverse supply of housing would help meet population growth forecasts. 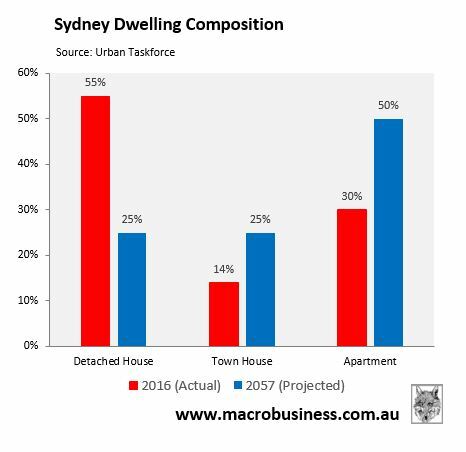 According to the Greater Sydney Commission, Sydney needs 725,000 more homes by 2036 — more than 40,000 new homes annually. The third “quick win” is the greater supply of diverse housing by simplifying the approvals process for compliant development applications or creating code assessable pathways to improve certainty of outcomes. The property industry group also recommends improving the clarity and consistency of total development contributions by publishing a development contributions calculator and the implementation of proposed e-lodgement system across all councils to streamline development processes. Harry said it was the second largest! IS it just yet another self-serving justification for transforming parts of Sydney into concrete and glass vertical canyons? IS it again telling everyone what great people they are, how dare people not agree with them? IS it forgetting to talk about the massive profits made through inflated margins in the building industry? WHY was there no mention of the presence of foreign buyers in the Australian domestic housing market? WHY does HT persist if it is so difficult and costly? -is it not the large number of new permanent residents that has created the call for additional dwellings ? -were the housing supply targets set by the NSW Government at the behest of the developer lobby? within the Macquarie Park Business and IT Park replaced by like residential developments? Read this article that reflects widespread community views about Overdevelopment! The property development industry is the largest employer in NSW and generates billions in government revenue. Certainty of process is key for us while we navigate the planning system, which takes many years and a lot of effort, but if we get it working the rewards are for everyone. 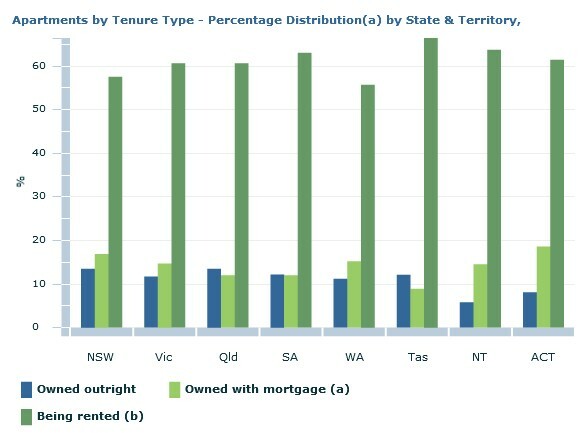 Currently, planning system delays in this state are costing billions in investment and tens of thousands of jobs (according to the Property Council of Australia, one in four people in NSW rely on our industry for employment). It is also costing substantial government income, which is critical for the delivery of schools, hospitals, roads and services. Over $250,000 is collected per unit sale in NSW (with an average sale price of $950,000) including GST, land tax, stamp duty and council contributions, which also play their part in housing prices. Accordingly, a thriving property development industry is critical to the success of the state and now we need more certainty than ever for the market to recover, but that seems to be politically inconvenient. We think the market has stabilised so the economy needs us to start building, and we are well positioned to build as we don’t rely on the banks. But we find it very difficult in NSW. We spend years and a lot of ­effort to progress projects as per the requirements, directions and approvals of the local council and state government. Even when you comply with all policies, get relevant approvals and agree to substantial extra contributions through “voluntary” agreements to ensure we are sharing the value of an increase in development, it still takes years and you don’t know what you will get until the very end — and even then, that can change. Then, if approved, we still need a DA from the council to build. It can take many years to deliver what they want, while we absorb enormous holding costs, which further adds to housing prices. The Meriton towers proposal area in Macquarie Park, shaded in red. In Queensland, they have an efficient planning system in place to get the right development in the right location efficiently. It is built in to their system so there is transparency. There are no lengthy separate planning processes, no planning panels and no additional charges that add to the cost of the development — and we believe our buildings generate superior design outcomes in Queensland. We deal directly with the council only and we have approval to build within six months. It is a tough market but we can proceed quickly and with certainty. In NSW I have had to commence a court case for my development in Macquarie Park, which is regrettable. I’d much rather work with the government for good planning outcomes. I will leave the detail of that case for the court process but I will say this — I have been building in Ryde for the past 35 years. The name Meriton came from Meriton Street in Gladesville. Of course developers make money, but they also contribute homes, jobs and amenities to the local community. • Better quality buildings through design competitions. But this is inconsequential when there is an election on foot and a small minority of the community can have a substantial impact on well-planned projects getting off the ground to the detriment of the broader community. That is why we encourage people who live in units or depend on our industry for their jobs and livelihood to get involved and make their voices heard. That way, the politicians will have both sides of the story when making decisions. Normally, both sides of politics would be falling over each other to support the right development in the right location, but the election has got the better of them at the moment and that can be bad for everyone. All we can hope is that due process is allowed to continue so we get the best possible outcome for our developments and we can focus on fixing the planning system. Harry Triguboff AO is founder and managing director of Meriton Group. NOTHING will change for the better if the Libs are voted back in on Saturday! More of the same & then some!! & LANE COVE … where the MP met with 53 developers between Jan – Sept 2017 and not a single resident! Photo: Meriton: Harry Triguboff proposal for 112 Talavera Road, Macquarie Park; legal action underway to increase floors and space ratio … 63 storeys? Photo: The Northern District Times; Waterloo Road, Macquarie Park, JQZ Prime, a Precinct in itself! It is the seat that usually goes with government — and, despite polls showing a sizeable swing against Victor Dominello, the sitting Ryde Liberal MP is expected to hold his seat on Saturday. Two recent YouGov Galaxy polls have shown a swing of up to 8.5 per cent to Labor candidate Jerome Laxale, but Mr Dominello’s 11.5 per cent margin is likely to be enough to withstand the Ryde mayor’s challenge. Punters, however, are backing Mr Laxale to upset the finance minister at his third crack at the seat. Ryde Labor candidate Jerome Laxale with Labor federal Bennelong candidate Dr Brian Owler. The TAB yesterday revealed Mr Dominello’s odds of winning had drifted out from $1.18 to $1.22 as Mr Laxale firmed in from $4.50 to $4. Both candidates agree that development is the hot issue on voters’ minds. *Mr Laxale claimed that the Coalition Government had turned Ryde into a “developers’ Disneyland” through its creation of priority precincts, where up to 15,000 new dwellings would be built at Macquarie Park. However, he conceded yesterday that Labor faces a tall order in beating the “big-spending” Coalition. *“The Liberals are outspending us and ruthlessly exploiting their incumbency,” Mr Laxale said. Mr Dominello has tried to blunt his perennial opponent’s anti-development stance by taking one himself. It flies in the face of his government’s development drive since the Coalition ousted Labor in 2011. But, the 51-year-old remains­ defiant in “fighting for my community”. “I have fought overdevelopment and given the community a voice,” he said. Mr Dominello also helped secure an “assurance review” by the Greater Sydney Commission into all Ryde planning matters. The first part of the report was released a fortnight ago, confirming Ryde was caught in a planning mess. Labor’s planning spokeswoman Tania Mihailuk accused the government of wasting taxpayers’ money in using the report as part of a “political fix” to help get Mr Dominello re-elected. And then, in an election-eve bombshell, Australia’s richest property developer, Harry Triguboff, revealed to the Times last week his company, Meriton, was suing Premier Gladys Berejiklian and other government agencies to get a controversial high-rise development at Macquarie Park approved. Meanwhile, at neighbouring Epping, the race is equally about development­ issues. However, Treasurer Dominic Perrottet is expected to easily win his third different seat in as many state elections. *Police are investigating Ryde Liberal MP Victor Dominello’s staff over an alleged leak of confidential information about NSW Labor leader Michael Daley’s wife. NSW Labor leader Michael Daley. Mr Daley later reported it to police over a possible breach of privacy. Yesterday, police said the Financial Crimes Squad had launched a probe into the matter. “Detectives have spoken with a number of people and inquiries are continuing,” NSW Police said in a statement. Mr Dominello confirmed that his office had been contacted by police and was “assisting them with their investigation”. Deputy Labor leader Penny Sharpe said if ministerial staff were using confidential information for a “political hit job”, then it’d be “an unprecedented abuse of power”. The call from Mr Daley’s office related to a car he owned that exceeded the speed limit by 10km/h while driving through Banksmeadow, in Sydney’s south, in May 2017.